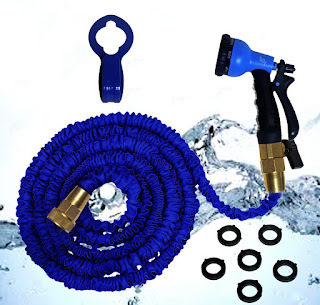 In the past I have mostly used traditional garden hoses, but I ordered this Expandable Garden Water Hose, 50 Ft, Flexible & Heavy Duty with Brass Shut Off Valve by RY and am so glad I did. It is currently the end of February and as you may know, I haven't had much of a chance to give this a thorough test yet since the winter weather doesn't let me start my outdoor gardening yet. We have had a few very nice days though, so I was able to take it outside and do a little outdoor testing on it and it worked very well. This year I plan on expanding my garden and needed a few more hoses in order to more easily reach some of the areas where my plants will be. If you have ever carried a traditional garden hose, or worse, multiple garden hoses across a yard, you will know that they get quite heavy. I love how this hose expands from 5 meters empty to 15 meters when filled with water. This expandable garden hose is lightweight, yet sturdy. This one has 4 layers instead of the 3 layers that many other similar expandable hoses have, which really adds to the sturdiness of the product. I expect that this hose will hold up very well to repeated usage. It comes with brass fittings on each end, and an 8 position sprayer which ranges from a very light mist to a strong spray.This is a high quality hose, with a high quality sprayer. I am very happy with my purchase and am happy to recommend it to others.